My Lord, Please Sanctuary Me: There's a Storm Coming! As if it was not enough to worry about my husband's oldest daughter and her family in the Houston area when Hurricane Harvey dumped the heaviest of rains for several days (and they were just fine, thankfully, with a little flooding in the roads mostly) now we have Hurricane Irma and its tagalong Hurricane Jose setting a course for Florida's eastern coast, towards the Queen Mother. The Queen Mother is not very happy with any kind of change, but when she found out from some of the residents that last year they ended up in a school and some had to sleep on the floor...well, actually, I just cannot find the perfect word to adequately describe how she has been expressing her feelings on the matter right now. I can think of only one time that she and her husband actually evacuated, coming here to stay with us two days, when the Princess was a young thing, and then they went scurrying back home in fear of looters and never did it again because they worried more about the house being away from it than the storm itself. In the fifty years they lived there, they never had flooding in the house, but I have seen row boats in the street once. So, all those years that we worried about them and then her alone with such storms, asking—begging, really—for her to move and now she is unhappy with us for where she is, which is closer to the coast than she was, but that is the facility we could get her in at the time being that she was not yet approved for Medicaid. However, as messy as evacs go, my husband and I feel less stress about it because the Queen Mother is being taken care of by people rather than being alone in a house. The nursing home has had more time to plan and they are going to start the evacuation process today. 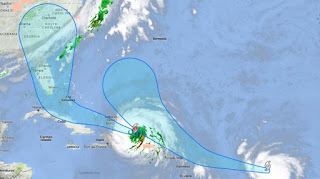 They were considering a place further north and a bit more inland but since have settled on evacuating everyone to a sister facility in Orlando, in the middle of the state, which will likely also be affected, but usually not as badly as the coastal areas where they are presently. However, this is a huge storm! I have heard of it described as the size of Ohio and in another place they measured the diameter against Florida, which very nearly took up the complete length of the state from the north border to its southern tip. It is massive and so very strong. I cannot imagine what it is like for the people in Barbuda, where every house has been damaged. Although it will have lost strength, it still will affect us here in Georgia as well. My husband is coming home and he may not be going back out at the beginning of next week. We inherited a generator from the Queen Mother's house that my father-in-law bought many years ago and was never used but maybe once. It is not a very good one, but my husband was trying to get it working for more than just a few minutes so he could sell it and get the one he really wanted. It has always been our intention to become a bit more self-sufficient and prepared especially with two big freezers full of food. So, yesterday my husband and I decided it was time to get one that really works, before people here decide to do the same. He knew exactly what model he wanted and how much it was. The problem was more about where to go pick one up, because while a number of chain stores claim to sell it, most of them have to ship it, and with a hurricane coming...well, it is just more iffy about whether or not we would get it before the storm hits. But instead of having to drive an hour away to a place that would more likely have it (I would have called first), I found a small local, family-owned business that had one in stock a few minutes away. They even put some gas in it to be sure it would run. I just love small businesses, they usually have such great customer service! Usually, their prices are higher, but not in this case, so good all around. They placed it in my van for me and now we have a generator, one that we can use for camping and hunting as well as power outages. I would be happy except that it is in the back of my mind that this is a precaution against the damage this storm could cause. My Lord, so many people are being affected by these powerful storms. Please, my Lord, be gracious with Your mercy and help us all to help those in need. Here Irma is described as the size of Tasmania ~ our separate island at the bottom ~ & the biggest storm on earth. I imagine, like us, you get these often enough to know what to do but my heart breaks for the Caribbean where literally everything has been smashed. I knew that basically wherever a person is in Florida was going to be affected but now they are predicting it to go right up Florida and into Georgia. It will lose strength over the land but the cost to do that will be great.